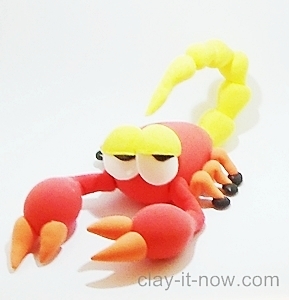 Scorpion Clay in Two Colors - So cute! 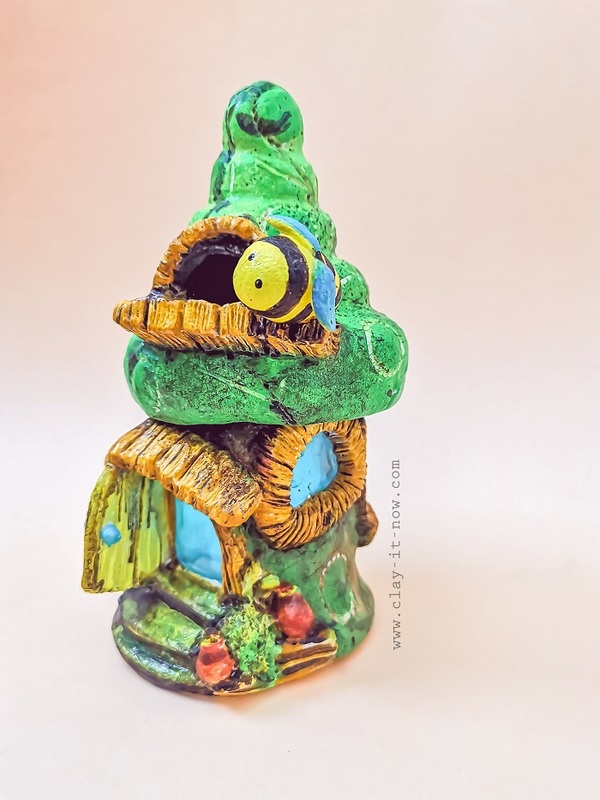 Scorpion clay is a great gift idea for scorpion lovers who keep scorpion as a pet. Yes, a pet! So for the figurine, we've made this in cartoon or kid's modeling style and it has two bright colors. Our tip is only one! Choose the color you like. You don't have to follow our choice of clay color though. After the clay well conditioned, roll the oval shape for the body. You can vary the the thickness to make the animal looks fat or skinny. Roll another 2 oval shape clay, pinch at one end and roll it again to form sharper shape. It looks like comma when finish. Roll 4 small oval shapes in different color for the claw. Roll 6 pieces of skinny sausages or pipe shape and bend them in the middle for legs. Also, roll 6 small ball shape in black color and flatten them. These are for the feet. Attach the claws to the front leg (comma shape). And, prepare the clay for face feature. Two small white clay balls for eyes and 2 black thin crescent shape for the pupils and eyelids. Roll 5 cones shape with 5 different sizes, from big to small for the tail and 1 comma shape for the sting. All same color with the eyelids. Take the body and hollow one side a little bit with your clay tools. Attach the tail to the body with white glue including the sting. You'll see that we have used tissue or kitchen towel to support the body and tail of the scorpion until the clay dry. Turn the tail up and start putting in the eye balls, pupils and eyelids. Adjust the position of the pupils and eyelids to add character to your figurine. Well, you don't see a deadly creature here but cute and adorable animal figurine. Ready to make one for your friends as a souvenir? Hope the picture above is easy for you to follow. But, if you have any question or comment, please contact us at any time. Btw, please "like" our facebook page so, you'll be notified if we have new tutorials.